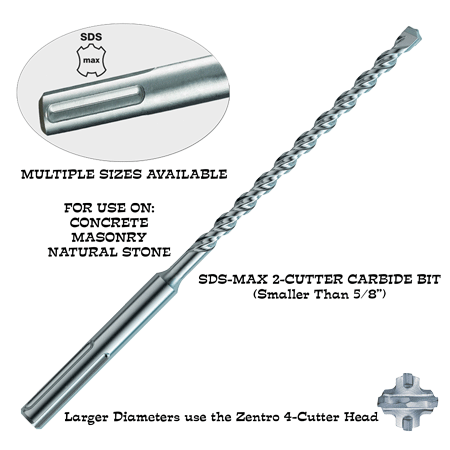 1/2" Diameter x 21" Overall Length with an 15-1/2" drilling depth with an SDS Max Shank. Builders Depot® SDS-max® Carbide Drill Bit with two carbide cutter head. This two carbide cutter head design has been steadily improved over the years and meets the professional user's highest technical requirements. The dynamic two cutter head proves its excellent qualities time and again in practice under the toughest conditions. The drill bit head has a unique 130 Degree Carbide tip angle which helps facilitate centering. The improved quality of the two cutter head design rapidly penetrates the material and quickly channels the drilling dust into the large volume H-flute. It is a cost effective solution for faster drilling. The use of high quality alloy steel in conjunction with specialized hardening, surface treatment, and soldering techniques produces a durable drill bit. The result is exact, perfectly dimensioned holes. 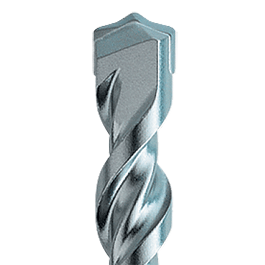 High drilling speed due to the large volume H-flute geometry. High flexural strength due to the optimized flute core thickness.